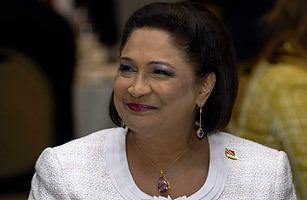 Kamla Persad-Bissessar, leader of the United National Congress, oversees a coalition of five political parties. Since being sworn in on May 26, 2010, the onetime attorney general has laid out ambitious plans to tackle the country's growing murder rate, boost pensions and slash the number of people living in poverty (currently one-fifth of the population). A former social worker, she's known for compassion: she has looked after her brother's two children since he died in a car crash 20 years ago.